Although the title of this week’s podcast may sound similar to that of podcast 3, there are two important differences: (1) this week, we’re having Irish breakfast tea and a lemon knot instead of a latte and chocolate chips, and (2) this week’s talk is three minutes shorter! Note: On some devices and browsers there’s a delay before the player begins: up to a minute or so. If your browser doesn't like the player, please try opening this page in a different browser or on a different device. 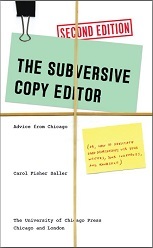 These podcasts were adapted from material I first presented in the Copyediting audio conference “The Subversive Copy Editor Takes Your Questions,” December 10, 2009 (© 2009, Copyediting), with the kind permission of the publishers; and from my own book, The Subversive Copy Editor, 2nd ed. (Chicago: University of Chicago Press, 2016).